Output Voltage Swing The output voltage swing consists of two distinct segments. First, there is the turn-on voltage VGHx between pins GHx and VEx. VGHx is regulated and maintained at a constant level for all output power values and frequencies. The second segment of the output voltage swing is the turn-off voltage VGue VGb< is measured between pins GLx and VEx. It is a negative voltage. It changes with the output power to accommodate the inevitable voltage drop across the internal DC/DC converter. The low-cost SCALE-2 dual-driver core 2SC0435T combines unrivalled compactness with broad applicability. The driver is designed for universal applications requiring high reliability. The 2SC0435T drives all usual IGBT modules up to 1700V. The embedded paralleling capability allows easy inverter design covering higher power ratings. Multi-level topologies are also supported. The 2SC0435T is a very compact driver core available for industrial applications, with a footprint of only 57.2 x 51.6 mm and an insertion height of max. 20mm. It allows even the most restricted insertion spaces to be efficiently used. Compared with conventional drivers, the highly integrated SCALE-2 chipset allows about 85 % of components to be dispensed with. This advantage is impressively reflected in increased reliability at simultaneously minimized cost. 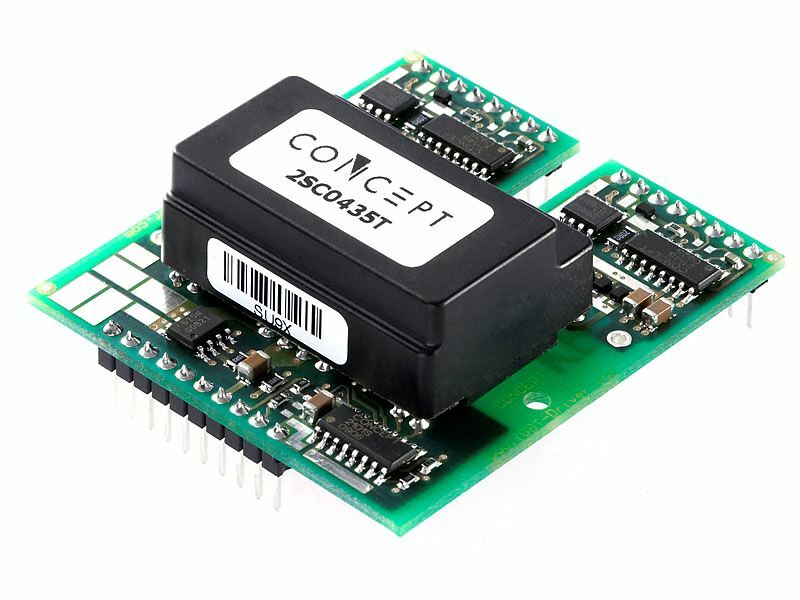 The 2SC0435T combines a complete two-channel driver core with all components required for driving, such as an isolated DC/DC converter, short-circuit protection, advanced active clamping as well as supply voltage monitoring. Each of the two output channels is electrically isolated from the primary side and the other secondary channel. An output current of 35 A and 4 W drive power is available per channel, making the 2SC0435T an ideal driver platform for universal usage in medium and high-power applications. The driver provides a gate voltage swing of +15 V/-10 V. The turn-on voltage is regulated to maintain a stable 15 V regardless of the output power level.